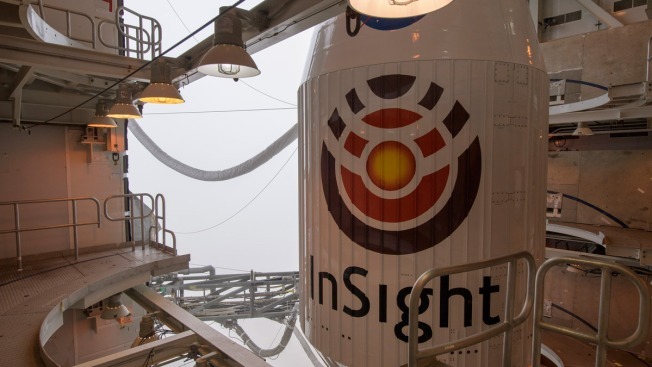 In this image released by NASA, a United Launch Alliance (ULA) Atlas-V rocket with NASA's InSight onboard awaits launch, Friday, May 4, 2018, at Vandenberg Air Force Base, Calif. The rocket is set to launch early Saturday. Also on Saturday, SpaceX was preparing to receive its Dragon resupply ship. The vessel left the International Space Station and was scheduled to return to Earth and splash into the Pacific Ocean about 3 p.m. ET, loaded with hardware and scientific samples from the ISS. The NASA spacecraft will take more than six months to get to Mars and start its unprecedented geologic excavations, traveling 300 million miles (485 million kilometers) to get there. Besides InSight, the United Launch Alliance's Atlas V rocket gave a lift to a pair of mini test satellites, or CubeSats, that are trailing InSight to Mars to serve as a potential communication link. They popped off the rocket's upper stage in hot pursuit of InSight, as elated launch controllers applauded and shook hands following the morning's success.